Japanese school girls practicing Kyudo (弓道, Japanese archery). Notice that there doesn’t appear to be anything to stop arrows that missed the target. These girls apparently didn’t miss. During the Meiji Period (1868-1912), many martial arts, including traditional archery skills, lost ground. To save these skills for future generations a group of Kyudo masters got together in 1896 (Meiji 29). Around the turn of the century, Toshizane Honda (本田利実, 1836–1917), who was an influential Kyudo teacher at Tokyo Imperial University1, started to combine the separate war and ceremonial shooting styles to create a new form of Kyudo. His decision, widely criticized at the time, is now seen as the reason that the art survived.2 It did more than survive. It became a popular sport at schools, including schools exclusively for girls, as in the photo above. In spite of its popularity, it took until 1949 (Showa 24), after a temporary ban imposed by the American occupation forces, before the All Japanese Kyudo Federation was launched. Finally, in 1953 (Showa 28), guidelines were published that let archers of different schools compete.3 Later, many international organizations were launched, and Kyudo is now practiced worldwide. What makes Kyudo unusual is that it is one of those rare sports that don’t discriminate. Practitioners can compete regardless of gender and age. The number of Kyudo practitioners is now estimated to be over half a million worldwide.4 Not bad for a skill that was threatened with extinction by the end of the 19th century. This photo comes from a year album for 1935 of a girls’ school in Okayama City, Japan. The 55 photographs show the female students studying, doing traditional Japanese as well Western sports, playing games, posing, at the train station and about town. The album also includes classroom scenes, portraits of teachers as well as administrative personnel and the Showa era wooden school building itself. For more information about education in Japan during the Meiji, Taisho and early Showa periods, read Okayama 1935 • School Girls Eating Bento. Okayama 1935 • School Girls Eating Bento. Okayama 1935 • Girls in a Classroom. Okayama 1935 • School Girls Reading. 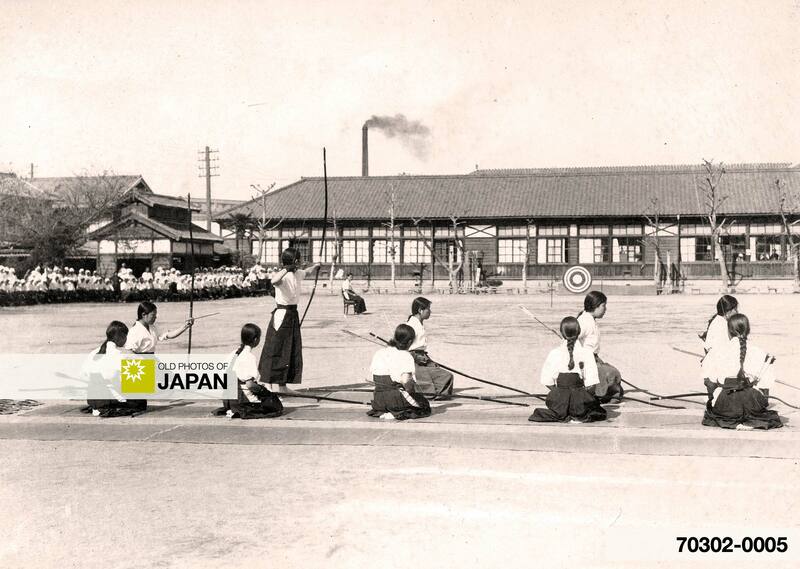 Okayama 1935 • Practicing Naginata. Okayama 1935 • Practicing Kyudo. Okayama 1935 • Practicing Table Tennis. Okayama 1935 • Playing Toryanse. 1 Yamada, Shoji (山田奨治, 2001). The Myth of Zen in the Art of Archery. Japanese Journal of Religious Studies, 28/1–2. 2 Onuma, Hideharu & DeProspero, Dan (1993). Kyudo: The Essence and Practice of Japanese Archery. Kodansha International, 20. ISBN 4770017340. You can also licence this image online: 70302-0005 @ MeijiShowa.com. A fascinating site with comprehensive details about each photo that help put everything in context. One small correction on this page – I think “threatened with extension by the end of the 19th century.” should read “threatened with extinction”. I would like to volunteer my services to you. Anything that you need in an administrative function please feel to contact me.